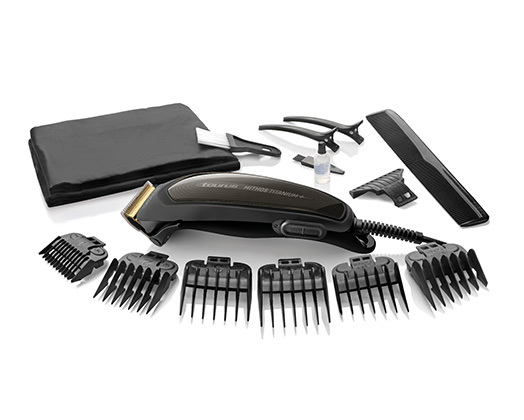 Home Products Taurus Hair Clipper 16 Piece Set Titanium Black 6W "Mithos Titanium Plus"
Keep your hair & beard in perfect salon trimmed condition all year round with the Mithos Titanium Plus from Taurus. ||This professional easy cutting system has an ergonomically designed body for comfort grip. The Mithos Titanium Plus has adjustable taper control for precise trimming along the neckline and sideburns with titanium blades. ||Six attachments combs are included: 3mm, 6mm, 9mm, 12mm, left & right taper combs.